After Wild Start, Silence From Bo Xilai Corruption Trial : The Two-Way Chinese authorities clamped down on information coming out of the trial, one day after the defendant appeared to run circles around his accusers. 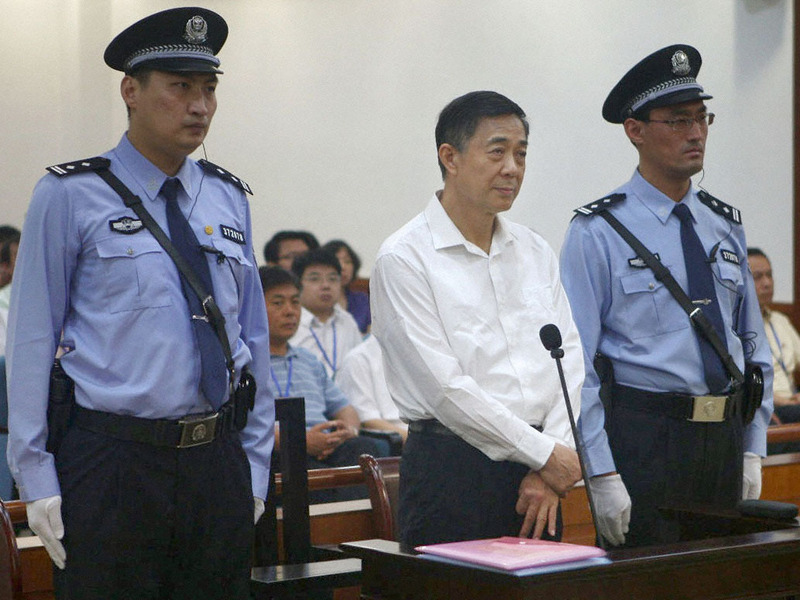 Bo Xilai, in white shirt, on Thursday during his trial on corruption charges at the Jinan Intermediate People's Court in China's Shandong Province. Chinese authorities clamped down Friday on information coming out of the high-profile corruption trial of one-time rising political star Bo Xilai. As NPR's Anthony Kuhn reported on Morning Edition, during Thursday's opening day in court Bo appeared to run circles around the judges and prosecutors. He denied any guilt, claimed a confession he gave had been coerced and called the testimony of his own wife "laughable." "The government feels like it lost control," Anthony told Morning Edition host David Greene. So, unlike on Thursday, very little was posted Friday on a micro-blogging site that is tracking the trial. Also, streets outside the courthouse in Jinan were cleared. On Thursday, people had gathered and engaged in lively debates about Bo. Friday, there was no one. "Bo is charged with abuse of power for allegedly obstructing the investigation of a case that saw his wife convicted of murdering a British businessman in the southwestern city of Chongqing, where Bo was party boss until he was removed last year. Bo also is accused of taking about $3.5 million in bribes from two businessmen in northeastern China, where he had earlier served in top political positions." "No one doubts that Bo will be found guilty at the trial. The case is largely seen as the result of a power struggle at the highest levels in China. The Communist Party is above the nation's judiciary, and despite officials' frequent protestations to the contrary, China does not have the rule of law."